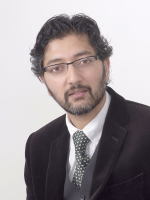 Mr Abraham is a Consultant Trauma and Paediatric (Children's) Orthopaedic Surgeon based at Leicester Royal Infirmary with a private practice at Nuffield Health Leicester Hospital. Mr Abraham has trained in Newcastle and at the Booth Hall Children's Hospital in Manchester. Prior to that he was a medical student in Edinburgh where he also completed his junior training. Mr Abraham’s clinical practice consists of both adult and paediatric trauma with particular expertise in circular frame fixation for complex peri-articular fractures, non union and infection. ABRAHAM, A., HAJIPOUR, L., INNES, A., PHILLIPS, H. and MCCASKIE, A., 2006. Are national guidelines for total hip replacement in the UK reflected in practice? Annals of the Royal College of Surgeons of England, 88(2), pp. 108. ABRAHAM, A. and MACNICOL, M., 2001. Growth arrest lines and recurrent patellar dislocation: a new sign. The Knee, 8(2), pp. 163-165. ABRAHAM, A., 2003. Undertreatment of osteoporosis in men who have had a hip fracture. Archives of Internal Medicine, 163(10), pp. 1236. ABRAHAM, A., 2003. Emergency treatment of ankle fracture dislocations-a reliable technique for early reduction. Annals of the Royal College of Surgeons of England, 85(6), pp. 427. ABRAHAM, A., HANDOLL, H.H. and KHAN, T., 2008. Interventions for treating wrist fractures in children. Cochrane Database Syst Rev, 2. ABRAHAM, A., KUMAR, S., CHAUDHRY, S. and IBRAHIM, T., 2011. Surgical interventions for diaphyseal fractures of the radius and ulna in children. status and date: New, published in, (11),. ABRAHAM, A. and RUSSELL, T., 2001. General practitioner's back pain referrals: easing the load? Journal of Integrated Pathways, 5(3), pp. 133-135. ABRAHAM, L. and ABRAHAM, A., 2002. Health care in Britain remains variable. BMJ: British Medical Journal, 324(7353), pp. 1584. KHAN, S.K. and ABRAHAM, A., 2011. Telesurveillance of circular frame pin sites: one year's experience at a specialist unit. Journal of telemedicine and telecare, 17(4), pp. 210-213. QUINBY, J.M. and ABRAHAM, A., 2005. Musculoskeletal problems in cerebral palsy. Current Paediatrics, 15(1), pp. 9-14. ROBINSON, C., ROYDS, M., ABRAHAM, A., MCQUEEN, M. and CHRISTIE, J., 2002. Refractures in patients at least forty-five years old a prospective analysis of twenty-two thousand and sixty patients. The Journal of Bone & Joint Surgery, 84(9), pp. 1528-1533. In a survey of patients seen at the Leicester Royal Infirmary, Mr Abraham scored an average of 5.5 points out of 6 for patient satisfaction. This included ratings for communication skills, efficiency and professionalism.